Cornea: It is the clear anterior most part of the eye. This part of the eye is coated with a tear film which is produced by the glands present in the lids. Anterior chamber: This space present behind the cornea is filled with a fluid called aqueous. Aqueous is clear like water and is responsible for maintaining the pressure of the eye and for supplying nutrition to the surrounding structures. Iris: This diaphragm like structure is responsible for the colour of the eye and it controls the amount of light entering in to the eye. Lens: This biconvex crystalline lens is responsible for focusing light on to the retina. The lens changes shape to see the objects at near and at far. As we age the lens becomes less flexible and is unable to accommodate for near (Presbyopia). This condition is corrected by reading glasses. Another change that occurs in the old age is the development of cataract when the lens becomes opaque. Surgery is required for this condition and the opaque lens is replaced by a clear artificial lens. Vitreous: This is a jelly like fluid that fills the eye. It is attached to retina at certain locations. With age the vitreous becomes liquefied. Retina: This is a neurosensitive tissue which is the innermost layer of the eye. It converts light signals into electrical signals that are carried to the brain. Center part of retina is called macula and is responsible for clear and detailed vision. 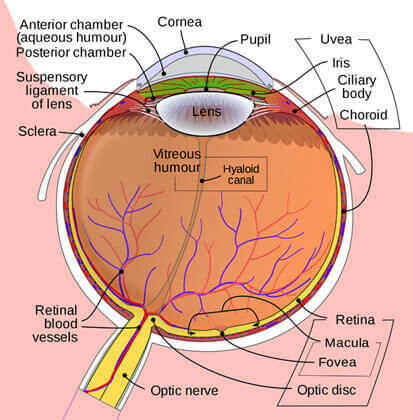 Retina is composed of several layers each having a definite function. Choroid: Choroid is a thin layer of tissue that is part of the middle layer of the wall of the eye, between the sclera (white outer layer of the eye) and the retina (the inner layer of nerve tissue at the back of the eye). The choriod is filled with blood vessels that bring oxygen and nutrients to the eye. Optic nerve: This takes the information from the retina as electrical signals and carries it to the brain where it is converted into visual signals. Optic nerve is damaged in glaucoma due to raised intraocular pressure.